OK, enough with Spring/Summer… here’s my favourite season (in terms of colour – definitely NOT weather!). It’s a large, 12-piece collection which can be split into the usual sophisticated yet dirgy, autumnal shades and rather awesomely, some fall-toned brights too! From the bottle shots, the brights look like they may be metallics but I’m not 100% on this – I’ll have to wait to see some swatches before I can confirm! I’m pretty divided on this Touring America collection. Autumn is the pinnacle of nail polish collections for me, it rarely gets better and if this represents the best of what I have to look forward to from one of the biggest players in the polish world. I’m just not sure I’m as excited as I hoped I would be. Coming from someone who loves their grungy, dirty shades… I would have liked to see OPI mix things up a bit. Get adventurous with the dirge! Some different textures maybe? I don’t know… as I said, I haven’t seen these in person so there may well be something about them that lifts from the standard cremes. I hope so but at the moment I’m left with an overwhelming feeling of deja-vu. Thinking back to last year’s Swiss Collection (of which I own the majority! ), I’m just not getting the same buzz from this year’s offerings although I am pleased to see OPI carry over some Summer shades whilst giving them an interesting Autumn edge! These will be available from LenaWhite, priced at £10.50 each. 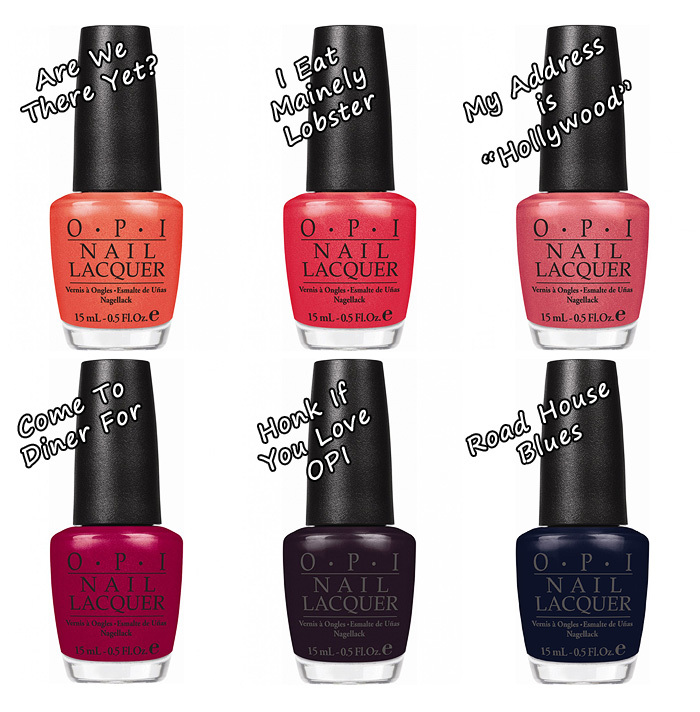 What are your first impressions of OPI’s Touring America Collection? oh no I will probably want them all when I see the swatches. Not good for my purse. From the images, I like my address is hollywood and are we there yet but depending on how they look in person the dark shades could be interesting too! I love all the brights but the dingy shades, whilst nice, aren’t very adventurous. But seeing as I basically want to marry anything OPI come out with, I will probably be picking up most of these. I actually really like some of them! I want French Quarter for Your Thoughts desperately, although I’m not sure how much of that is related to the fact that I live in New Orleans and am counting down the days until I can get back there. Other than that, I want Honk if You love OPI, I Eat Mainely Lobster, and Road House Blues. I can never tell if I like a polish from the bottle. I’ll say the greys don’t catch my fancy, but I’m sure once I’ve seen swatches I’ll be added them to my want list! 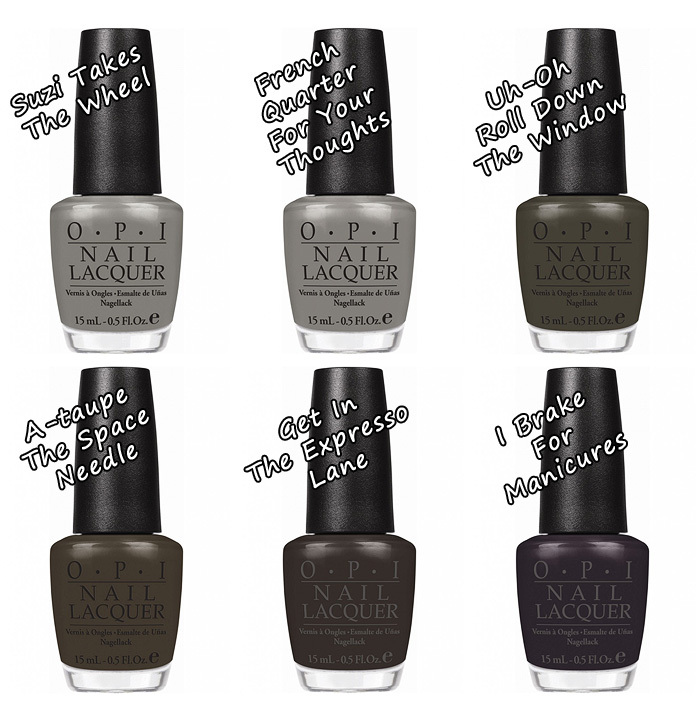 Honk if you love OPI is on the wishlist, now.